After 40 years and 20 films, James Bond finally got to meet his employer - Her Majesty the Queen. 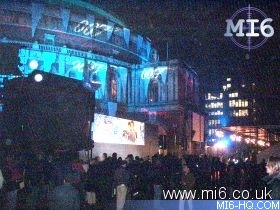 MI6 can bring you a report from behind-the-scenes of the Royal World Premiere. 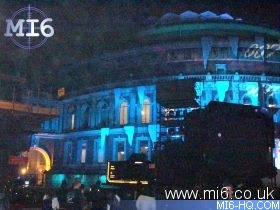 The Royal Albert Hall was transformed into an Ice Palace with the help of 500 twenty-foot artificial icicles on loan from Germany and more red carpet than the Oscars - Gustav Graves would have been proud. 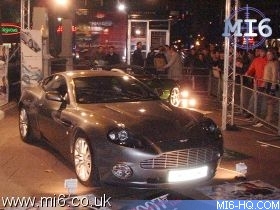 The Royal Annual Film Performance of 2002 lured stars from past and present to the biggest premiere a Bond film has ever seen. Among the previous cast members attending were Britt Ekland, Fiona Fullerton, Richard Kiel, Maud Adams, Shirley Eaton, Lois Chiles and theme song legend Shirley Bassey. What better way to celebrate the landmark anniversary than to bring all the previous Bond actors together. The unprecedented meeting of former 007 stars - George Lazenby, Roger Moore, Timothy Dalton and Pierce Brosnan - arrived to huge cheers from the crowd of thousands (unfortunately Sean Connery was unable to attend due to filming commitments). The current 007 made an explosive entrance as 45 vertical jest of flame roared down the edge of the red carpets before Pierce Brosnan emerged from his car to spectacular cheers. Inside, producer Michael G. Wilson introduced the cast to Her Majesty the Queen and the Duke of Edinburgh Halle Berry said the film was "as much fun to make as it looks" and Pierce Brosnan told the Queen that he intends staying on for at least one more film. The Queen was greeted inside the theatre by a fanfare from six trumpeters shortly before the infamous gunbarrel started the action. 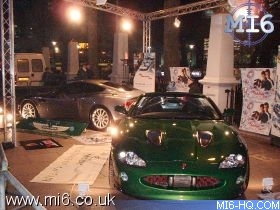 MI6 gained exclusive behind-the-barriers access to the other stars of the premiere - the cars. 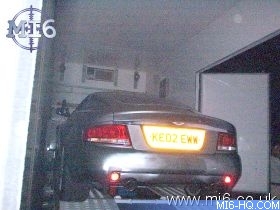 Exclusively pictured here is the flagship Aston Martin Vanquish as used in Iceland. The car was still fitted with the Mustang V8 engine that was swapped in to create more space for Bond's gadgets under the bonnet. 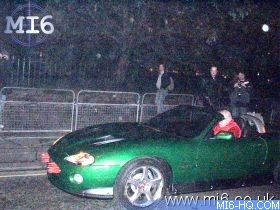 Left: 007's latest car with genuine number-plate KE02 EWW as used in the film. 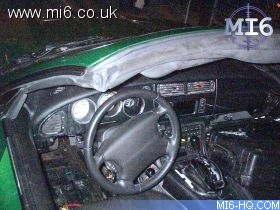 For the first time ever, this picture reveals what the real Q-Branch have done to the Jaguar XKR to be able to control all the additional gadgets. The gearbox has also been swapped out for a new automatic to control the same Mustang V8 engine as used in the Vanquish. 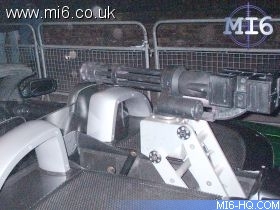 Below: A close up of Zao's gattling gun, and the XKR prepares to leave. Meanwhile in Leicester Square, the Empire UCI screening was getting under way. The almost simultaneous screening was put on to accommodate the unbelievable response for tickets. 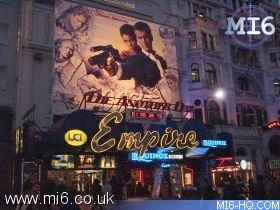 The huge electronic countdown ticked away the seconds underneath a 50 foot version of the International release poster. The screenings at the Royal Albert Hall and Empire UCI raised approximately £500,000 in aid of the Cinema & Television Benevolent Fun, a charity that helps the people behind the cameras. 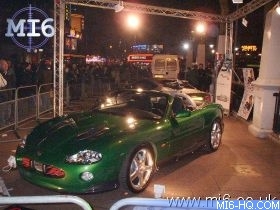 Below: Publicity versions of the Aston Martin V12 Vanquish and Jaguar XKR were displayed for fans while they waited.